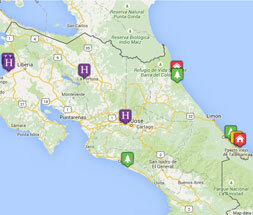 Tribes Overall: "Costa Rica is an amazingly diverse country. The different landscapes are all stunning in their own way. From volcanoes, valleys and rainforests to canals, lagoons and oceans - the scenery is impressive. For me, the many opportunities to see wildlife in their natural habitat were the highlight of the trip. Honestly, this holiday totally surpassed my expectations!" Tribes Service: "Tribes' excellent consultant, Rory McCormick, tirelessly restructured my itinerary to suit my increasing 'must see' places I 'had to' visit; coordinating all domestic flights, road and boat transfers, and changes of accommodation. He also very graciously answered all of my daft questions, so a big thank you to you Rory!" Guides: "Every single guide I met had exceptional knowledge about nature, culture and economy - in fact about anything that was asked of them. It was clear how passionate they were about conservation and the need for educating the world. They were also fantastic in dealing with little practical issues; and their expertise in spotting wildlife was invaluable. I would have to say the guides were key in making the holiday incredible - without them I wouldn't have seen all the animials I did." Social & Environmental Responsibility: "We are slowly, but surely, becoming aware of our negative impact on the planet. Sadly, not everyone is convinced of this fact; however, Costa Rica is doing a great job of educating its people in the importance of conservation, and in balancing conservation with business and tourism. Seeing with my own eyes the effects global warming has had on the animals has reinforced my choice to travel with Tribes because of their commitment to ecology and carbon offsetting. I will certainly be doing more to lessen my carbon footprint." I went to Costa Rica with the preconception of Parador probably being the best hotel I'd stay in - and I couldn't have been more wrong! I was disappointed with the standard of cleanliness and food, but mainly the service. Overall it wasn't bad, it just wasn't as good as the other places I'd stayed (especially considering the expense), and not all staff were friendly. Dinner service was very slow and not really worth waiting for. The first night I put it down to my own tiredness but the second night wasn't any better. The third night I went to a soda in nearby Quepos and their food was delicious at a fraction of the cost - and I left feeling full! Yes, the Parador and amenities looks amazing - as did their food - but once you get into it it's not that great. Four rooms per block, very clean and spacious but could hear noise from conjoined rooms. Surroundings are stunningly beautiful, being immersed in rainforest - only spoilt by traffic noise from busy, adjacent road. Meals were delicious and staff friendly, mainly bilingual, and very helpful in arranging any of the numerous tours/excursions on offer. A superb Lodge to visit for anyone interested in conservation. The interior of the hotel was stunning, however it was wasted on me as I only needed a shower and a bed for the night before being picked up at 5am. After an overnight stay in the capital, I was glad to have seen San Jose, but also very relieved to leave the huge, sprawling city behind to begin my adventure. The scenery driving through Braulio Carrillo National Park on the way to Tortuguero was magnificent. And then banana plantations - acres upon acres before arriving at the dock to board our boats; we saw caiman, crocodiles, basilisks, river turtles, heron and great green macaws - and that was just on the way to the hotel! I took every opportunity to participate in early morning tours and so glad I did because animals were much more active in the relative coolness of dawn; I feel very privileged to have seen three-toed sloths on the move. And the noises of the rainforest were both uplifting and soothing at the same time - even those noisy howler monkeys - no need of an alarm clock in Costa Rica! I would recommend going to an animal rescue centre, they do amazing work rehabilitating injured animals and/or caring for those that can't be released. It's a great opportunity to see animals close up. I spent an evening at a snake centre with a very knowledgeable guide who explained the circumstances of their centre; butterflies, amphibians, reptiles, birds and their latest addition, a two-toed sloth. The chocolate tour was also really interesting, in fact I filmed a lot of it on my phone and have watched it again with my family. Both the history and the process of chocolate making were explained and I'm now fussier about the quality of chocolate I buy, after tasting the real thing! On the two hour road transfer to Arenal region, the driver (whose English was as good as my Spanish - but we managed to communicate fine) pointed out all the different crops to me - pineapple, papaya, cassava root, different types of coconut depending on their usage and tropical plants for exportation. So even the seemingly more mundane parts of the trip were enlightening to me, and all the drivers were so helpful and friendly. Arenal seemed a bit more 'touristy' than other places I'd been up until then, but a great place for adrenalin junkies! I thoroughly enjoyed zip-lining, hanging bridges, hiking, horse-riding, and hot springs - all in primary and secondary rainforest; for the thrill-seekers there's plenty more to do, e.g. cycling, rappelling, canyoning, 'Tarzan' swings; fly-boarding, jet-skiing or kayaking on the 30km of Arenal Lake. I was fortunate to experience a couple of domestic flights, one from La Fortuna to Quepos and another from Drake Bay back to San Jose, they were absolutely fantastic! Because some parts of Costa Rica are inaccessible by road, I would definitely recommend small planes. It is fair to say the check-in person is a great multi-tasker; he's the luggage handler, plane guider, security and even your driver! Next stop was Manual Antonio, again quite a 'touristy' place, and possibly over full of people for me. The National Park was amazing though, where the animals have perhaps become too accustomed to humans and therefore put on a great show - especially the monkeys. The only disappointing part was the hotel I stayed in here, the Parador. For me it was just too big, and it was clear that staff struggled with the volume of people at mealtimes. However I really enjoyed a kayaking tour through mangroves in which the hotel arranged for me. Again there were plenty of animals to see whilst gently gliding through the waterways. Another highlight here was eating dinner at a soda in nearby Quepos which was full of local people - a sign the food would be delicious - and it was! The boat transfer to the Osa Peninsula was a great experience - mainly due to the mix of people packed in like sardines on the boat and everyoneâ€™s reactions in going from the relative calm of the Sierpe river to the more choppy Pacific Ocean. It was an exhilarating journey! Corcovado National Park was by far the most enjoyable part of the whole fortnight, mainly due to their limit of people into the national park (unlike Manuel Antonio). Also more time was spent here so more sightings of animals. Another highlight was the opportunity to see nocturnal animals during a night walk here; amphibians, reptiles, insects, tarantulas and scorpions, the extremely cute kinkajou and a second sighting of tapir. And being loaded onto the back of a lorry to get to the location was also an experience! Snorkelling in the warm waters around Canos Island and watching the sun set over the Pacific was a lovely way to end my adventure before flying back to the bustle of San Jose for my flight home.